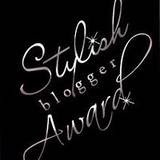 Ok...how cool is it when you open your comments and find that a fabulous blogger has awarded you the Stylish Blogger Award!!?? I am telling you it made my day and was the best thing EVER! Shannon from Grunged, Glittered n' Branded awarded this to me:) Thank you so much! Award 15 recently discovered great bloggers. Contact the bloggers and tell them about the award. 1. I am a BED HEAD. I usually wake up grumpy and it takes me a good 30 minutes or so to snap out of it. I prefer my nice, warm, cozy bed with the softest pillow known to man than begging my kids to get ready for the day and to eat their breakfast and to quit fighting. I don't see how the rest of the world is not a bed head! I mean...why be a morning person? 2. I love to bake desserts, take one bite of it and then pass them onto friends. Otherwise it will sit there and not be eaten! Although my 20 month old will eat every single bit of it if he could! 3. I am a girl in a boys world. I have 3 brothers, my husband has 5 brothers and I have 3 boys. There are NO girls and probably will never be any girls. I am starting to be ok with this. BUT...that is why I have this blog and that is why I love zebra print and pink. 4. I want to have a bakery one day. Major dream of mine that BETTER happen! I have a stash of recipes that I have tucked away and a menu all ready to go! I also have the layout and interior of the bakery all designed. 5. I have been to Brazil, Paris, London (2 times) and Rome. Love to travel and can't wait for the next trip...wherever that may be! Oh...camping...with all my boys...over spring break. Can't wait! At least I'm not 8 months pregnant and its my birthday, which happened 2 years ago. Also since I have been to London, it has made me REALLY obsessed with the English history. I love reading all those books from Phillipa Gregory and researching about the Tudors, Lancaster's, Yorks...etc. Totally obsessed! 6. I collect plates and stuff to entertain with. My whole garage is FILLED with this kind of stuff. I need a whole room dedicated just to entertainment. It's an obsession and sometimes REALLY hard to not buy stuff. BUT...I can say no! 7. Laundry is my nemesis. I hate it with a passion and I really just want to throw all of our clothes away and start over. I mean...who doesn't like to hang up NEW clothes? It just makes sense! But...when you have a mountain of laundry that needs to be folded and another mountain that still needs to be washed...it just overwhelms me and then I don't do it. The end. Here are blogs who also deserve this fabulous award!! Thank u, summer! Made my day! Thanks for the award! I've been to Brazil too and loved it. Where did you get to visit while you were there? I lived in Brazil for 18 months and, during that time, I was in Brasilia, Rondonopolis, Palmas, and Posse. Thank you :) Made my day! Thanks so much for the award Summer! I'm so happy to find your blog~love it and am now following. I'm a bed head too and laundry is my least favorite chore also! You have traveled to some really great places. Great to meet you and can't wait to browse through the rest of your blog.